DuPont Protection Solutions has extended its official distributorship arrangements for Tyvek® Cargo Covers with AmSafe Bridport, the Dorset-based specialist in engineered textile solutions for cargo handling and cargo protection applications. AmSafe Bridport have been successfully working with DuPont since 2012 and has been instrumental in the successful penetration of Tyvek® Cargo Covers in the growing European and Middle East markets. 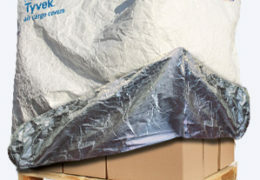 Tyvek® Cargo Covers are used to provide thermal protection for temperature-sensitive pharmaceutical and perishable products during the ground handling and air transportation phases of distribution. With a track record stretching back nearly four decades, AmSafe Bridport are seen as an excellent distribution partner to expand the reach of Tyvek® products and provide the all-important technical and application support on the ground. DuPont will be launching their third-generation range of Tyvek® Cargo Cover at the ‘LogiPharma’ supply chain event in Montreux, Switzerland on 19th – 21st April 2016.